The Multimedia Art Museum, Moscow presents ‘Inherit the Dust’, a new project by the celebrated British photographer Nick Brandt. Brandt first conceived the project ‘Inherit the Dust’ in 2014. Previously unpublished portraits of wild animals were printed in large format, pasted on panels and installed in locations where these animals once roamed but have now been wiped out due to human greed and indifference. Nick Brandt then photographed the panels, combining urban landscapes and animal images in a single frame. 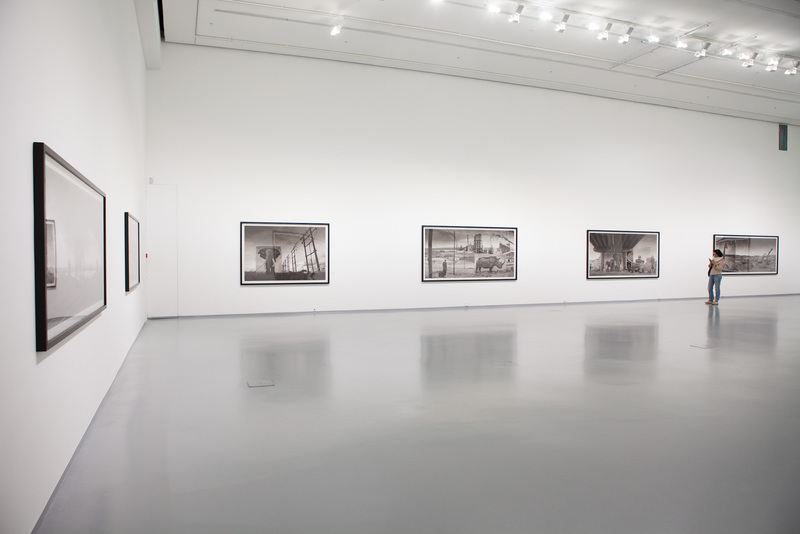 The exhibition is comprised of 19 photographs with titles that provoke a sense of dissonance in the viewer: ‘Wasteland with cheetahs and children’, ‘Factory with chimpanzee’, ‘Construction site with rhinos’, ‘Quarry with elephant’, ‘Road to factory with zebra’, ‘Railway line with lioness’, and so on. These animal pictures reminiscent of classic portrait paintings have been inserted in the threatening landscapes of urban outskirts and industrial zones, underscoring the extraordinary fragility of a world that is slowly but inexorably vanishing under the influence of man.